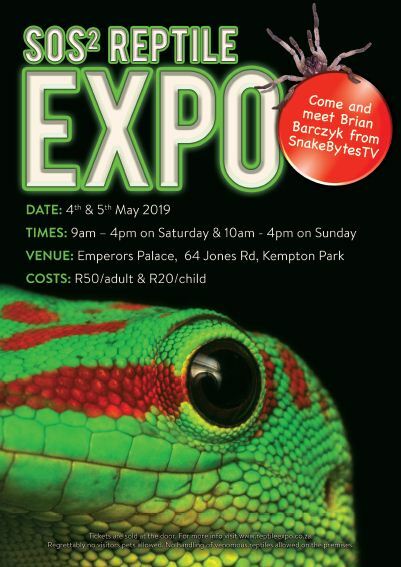 The SOS² Reptile Expo has proved to be the biggest of it’s kind in South Africa. In the past visitors have come from all over SA and a few even flew in from other countries to come see the reptiles we have available here in South Africa. Many thousands of people attended the expos to browse through or even just to come and see all types of fascinating reptiles on display. The community project for 2009 was the Swaziland Antivenom Fund, which was a success and with the aid of the reptile community were able to buy a number of vials of SAVP anti venom and hand it over to the contact person in Swaziland whom has put it to good use. In 2013 we also raised funds for the Kemp family after Henry Kemp suffered severe burns to his arms and legs while attempting to rescue his animals out of a fire at his facility. Here are a few pointers to remember: When attending the Reptile Expo, please do not bring your own reptiles / pets along with you. Remember it is stressful for your animal. All children under the age of 12 must be accompanied by an adult. No venomous snakes will be sold to children under the age of 18 or without the consent and in the presence of their parents. When making a purchase, ensure you transport them safely and securely to their new home. Do not leave a reptile in a car in the sun. You really produced a very successful and professional event and can rely on our participation at next year’s show.